Investment made for new PopIn Vehicle Graphics set-up. 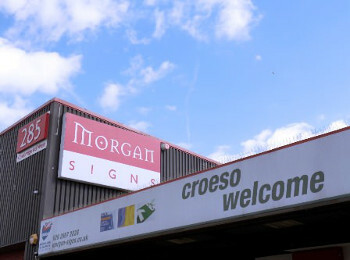 Morgan Signs is located in CardiffWith ISO14001 certification and a group-wide commitment to recycling and environmentally sound initiatives; investment in additional digital print capacity for high profile Cardiff sign and graphics company, Morgan Signs, stood a good chance of pointing towards a latex printer, but it wasn't just for green reasons that it chose a Mimaki JV400. 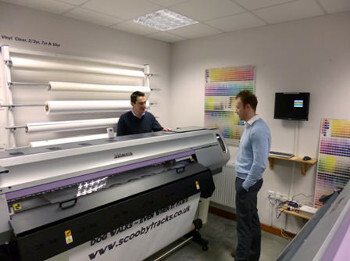 Sitting alongside the company’s Mimaki JV33, the new JV400 latex printer is primarly used for vehicle graphics"We had to offer faster turnaround times, so removing the need to out-gas prints meant latex was top of the list," he continued. "We looked at all the latex options and although alternatives initially seemed better at face value, once we dug a little deeper, the Mimaki had a number of compelling factors that made it an easy decision in the end." Hill continues to emphasise how working with Mimaki's UK distributor, Hybrid Services fits well with MS Group’s commitment to considering environmental factors in its operations. "Morgan Signs identified waste streams and Hybrid's "Let's Do MORE" rebate linked recycling scheme has been a significant bonus for us." PopIn Vehicle Graphics has a climate control double vehicle bay for applying graphicsThe scheme focuses on recycling Mimaki solvent ink cartridges and for the two Mimaki solvent printers that MS Group uses, it allows the company to advise prospective clients that it's following Hybrid's lead and "doing something where it can." "The construction industry is a big market sector for Morgan Signs and it's driving recycling as part of a moral and commercial obligation," continued Hill. "With our approach, allied to the company's production setup and ISO certification, we become an attractive proposition." The Mimaki JV400 latex printer used within the vehicle branding operation ticks a multitude of eco positive boxes, but that's just one of the many benefits that the boss of PopIn Vehicle Graphics is finding. "The smooth gradients, drop shadows and colour matching we're getting from the Mimaki RasterLink RIP software is so good that our production time has sped up even more," said Lovegrove. Simple, but very effective applied vinyl jobs that may once have been constrained to a limited range of off-the-shelf cut vinyl colours are now printed, laminated, cut out and applied in a seamless process, tied together with Mimaki's software package for the latex printer and cutting plotter.